This weekend is windy. Strong easterlies may deter fishermen, but not the fourteen intrepid cyclists who pedalled this morning’s easy ride. David J, Kelly, Ric, Allan, Sandra, Colleen, Roger, Rosemary, Wendy, Laura and Neil, John M and Richard were led around the circuit by Helen. Allan Marshall instigated this popular ride in the early years of the club, and it’s still a great circuit. 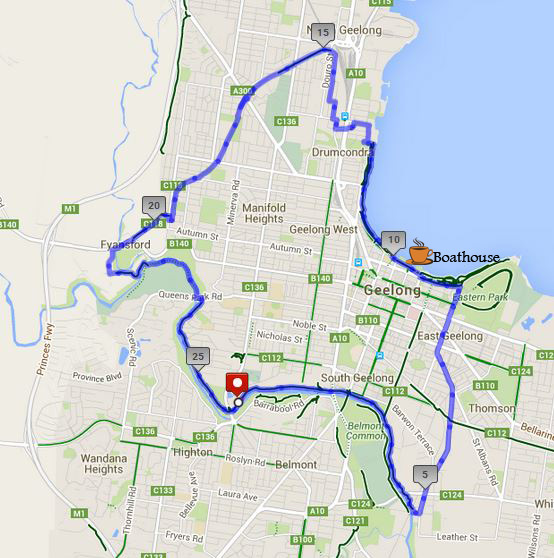 (Allan tells me that the original circuit takes in Boundary Road and Eastern Park.) Today the route was slightly shorter. From the Breakwater the route passes the Race Club and Show Grounds, before joining the waterfront at Garden Street. Today’s riders rode down Hyland Street, which has recently been upgraded (though the gradient stayed the same). Allan showed his former racing skills passing all at high speed on the smooth downhill. Roger left the ride at the bottom of this ascent, determined to ride back up. “I came down at 56kph. I’ll go back up at 6,” he quipped. With the upgrade a bike lane has been added to the ascent, making this much safer than in the past. A leisurely ride along the river soon brought the riders back to the start. It was good to see so many regular Saturday riders enjoying a slightly longer Sunday ride. Keep your eyes open for more easy-medium Sunday rides. Thanks to all riders for braving the elements, and to Rosemary and John for being our tail end Charlies. 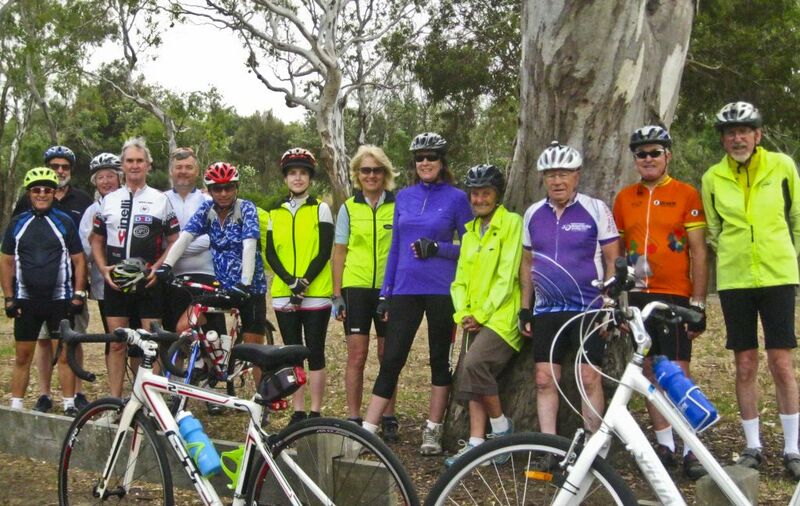 Back at Balyang… The riders go their separate ways. Two photos showing the Fyansford Railway Tunnel. This entry was posted in Ride reports and tagged Barwon River Path, Fyansford Cement Works Rail tunnel, Old Cement Works Rail Trail by hlyth2013. Bookmark the permalink.